One of the realities of the digital world we live in is that much of the reading we do is actually taken from visual cues rather than straight text. We do our reading in digital environs which are inherently multimedia environs. Thus, the visual must be addressed as essential to the literacies we expect of students. With that in mind, I’ve been gathering and developing visually-oriented writing assignments. 1. Find an older class yearbook (preferably from at least 20 years before you were born). Look through the yearbook and interview the person it belongs to. You might just sit down and flip through it together, discussing aspects of the yearbook and the memories it represents as you go. After the interview, write about what you’ve learned. 2. 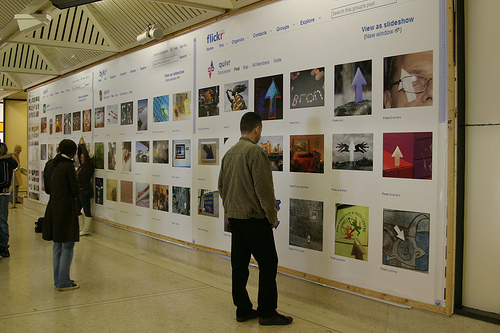 Study the work of a visual artist and interview that artist about his/her work. This might include painting, sculpture, photography, graphic design, or even cake decorating if the cakes are truly works of art. Write about what you learn from the artist and the art. With the artist’s permission, include photographs of the work discussed with your writing. 3. The WPA and the FSA collected many photographs of American life during the Great Depression. Study the work of one of those photographers–Dorothea Lange, Walker Evans, Gordon Parks, Marion Post Wolcott, Eudora Welty, or others–and find someone who lived during the Depression to talk to about the photographs. Encourage the person you interview to share memories of that time. Write about what you learn. 1. Go around town taking pictures of the most interesting signs and billboards you can find. Make a digital photo album or movie out of your collection, and write about any patterns, themes, or issues you observe in the collection. 2. Think of a social issue you believe is important to your own town. Take pictures that you believe tell the story of the issue. You might also video scenes that illustrate your issue. Put together a multimedia project with your finds. Write a self-reflection on the process of creating your project. 3. Go on a visual scavenger hunt of your own life looking for images that represent who you are in your home, your vehicle, your workspace, your closet, your backpack, purse, etc. Write an essay with photographs inserted about what you find out about yourself and what you think this does say to others. 1. Watch a movie with the sound turned off. Write a review of it based on visual content alone. Read about framing and filming techniques before you begin. 2. Review a website for its visual design. What visual messages are being sent? What design flaws do you see? How could a redesign clarify or enhance the content? 3. Find a collection of photographs on a particular topic, perhaps a photoessay published by a newspaper or news magazine. Write about your emotional and intellectual reactions to the photographs. Analyze and comment on the photographer’s techniques. These are just a few to get us started. I hope others will contribute ideas. for my ninth graders. This lesson asks students to respond to a prompt about an abstract concept (courage, hope) by taking photos, blogging them, and including their own written answers for why they chose the photos and what they saw. I’m hoping to use it in conjunction with a short fiction unit and have them connect their images to themes/concepts from the stories.